We’d love your help. 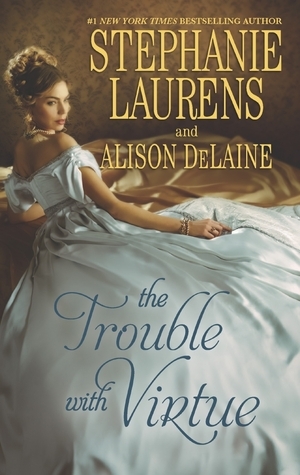 Let us know what’s wrong with this preview of The Trouble with Virtue by Stephanie Laurens. #1 New York Times bestselling author Stephanie Laurens and rising star Alison DeLaine bring you two tales of passionate temptation…and decorum overthrown. Miss Antonia Mannering has made plans that include her long-ago friend Lord Philip Ruthven. She knows Philip is popular with the ladies, but he has never married. Might he now be ready for a wife? If s #1 New York Times bestselling author Stephanie Laurens and rising star Alison DeLaine bring you two tales of passionate temptation…and decorum overthrown. Miss Antonia Mannering has made plans that include her long-ago friend Lord Philip Ruthven. She knows Philip is popular with the ladies, but he has never married. Might he now be ready for a wife? If she could only prove that she could run his home, not disgrace him in Society and be a comfortable wife, surely he would propose to her. But when love enters the equation, Antonia might be getting more than she bargained for…. To ask other readers questions about The Trouble with Virtue, please sign up. The Trouble With Virtue (2-fer) Stephanie Laurens' contribution, a reprint of an early book of hers called "The Comfortable WIfe", was written in the style of a "traditional Regency", but the characters and setting were so boring that I couldn't finish it. Alison Delaine's contribution, called "A Lady By Day" was practically unreadable, besides being pure wallpaper, as in "wallpaper historical". Classic Laurens and Delightful DeLaine! I have to say that these two stories make for a rewarding read. A Comfortable Wife is an enjoyable addition to my readings by Laurens. I adore her works and have read them all. Each new offering is like a national treasure. A Lady by Day won me over completely. An unusual storyline, great lead characters, guilty secrets, restrained emotion hiding volatile feelings. Not quite a regency pirate novel, although it does fit alongside that milieu, harkening as it d Classic Laurens and Delightful DeLaine! A Lady by Day won me over completely. An unusual storyline, great lead characters, guilty secrets, restrained emotion hiding volatile feelings. Not quite a regency pirate novel, although it does fit alongside that milieu, harkening as it does to places of stunning sunsets, balmy winds and hot climates, even though the story takes place in London. Josephine, Countess of Mareck and Sir Noah Rutledge's story is all one could wish for. So swoon worthy! I now have to find out more about the author Alison DeLaine and explore her other works, which also seem to reflect a love of Mediterranean climates and tall ships. This book is two stories in one. The first shows such promise to start and then hurries into nothing. I skimmed most of the end to get to the second book. It was only slightly better. I would have given it two stars if it stood alone. At least it had some interesting steamy scenes and a rather unique storyline. Stephanie Laurens was her normal self, but I kept getting discombobulated with "A Lady By Day". Regency characters simply don't say "Whatever" or "Fine." The rating and shelves are a reflection of "A Lady By Day" because the book doesn't exist by itself on goodreads.com and I rated A Comfortable Wife on its page. This title is hard to rate because it contains two very different novellas. I say pick it up and read the second one only (about 31% of the entire book), as it was light years better than the first. A Comfortable Wife was one of the dullest stories I've read lately, with awkward, repressed, stubborn characters who eventually get together after subjecting the readers to some stultifying balls and parties. 2 stars because at least it was grammatical. A Lady By Day, on the other hand, takes that rep This title is hard to rate because it contains two very different novellas. I say pick it up and read the second one only (about 31% of the entire book), as it was light years better than the first. Stephanie Laurens story is vaguely part of the Lester family saga - by vaguely I mean that Jack and Harry are mentioned a few times. The rest is boring, not up to the standards of her earlier books and one needs to force oneself to read through the misunderstandings, miscommunication and general silliness. The second title "A Lady by Day" is terrible, unreadable and has no redeeming values. I received a copy of this book through a Goodreads giveaway in exchange for my honest opinion. Since there are actually two stories in this book written by two different authors, I will review each story individually. I really thought that this book started off great. I haven't read any of the books in the series on which this book is based, but it didn't really seem to affect my understanding of the story in any way. So if you're in the same boat as I, just go ahead an I received a copy of this book through a Goodreads giveaway in exchange for my honest opinion. Since there are actually two stories in this book written by two different authors, I will review each story individually. I really thought that this book started off great. I haven't read any of the books in the series on which this book is based, but it didn't really seem to affect my understanding of the story in any way. So if you're in the same boat as I, just go ahead and jump on into this book. The story centers around Philip, a thirty-four year old who recognizes he should probably get around to his responsibilities, namely, that of getting a wife. How handy that his stepmother's niece, Antonia, is visiting his household. She arrived with the intent of becoming Philip's wife. Philip, at first, seems determined that this will not be the case. Romantic tension builds up nicely. The couple philander about the house and grounds. A plan is hatched for Antonia to go to London and experience her first season. There were so many possibilities for this story, but I feel like the crucial incident, a proposal, came too quickly. Smack in the middle of the story, in fact. After that, it didn't seem to matter what happened, which was nothing much, by the way. Antonia doesn't get into any real escapades while in London. The plot kind of hinges on another girl Antonia meets who is headed toward an arranged (almost) marriage that she wants nothing to do with. Antonia's younger brother hangs around in this story as just a convenient pair of hands. He plays piano and assists with the arranged marriage plot, but really, his presence doesn't add much to the story. And then the crucial (or so I would suppose) scene where Antonia finds Philip in a compromising position involves a woman with a reputation among the ton for having affairs with married men. She may have featured largely in the rest of the series, but I feel like her character existed only in the five pages in which she threw everything off in Philip and Antonia's relationship. It would have been nice to have this character around sparking jealousy from the time the couple arrived in London. I feel like that scene was too hastily done. And like I said, since the proposal happened early on in the story, the rest of the events didn't seem to matter because it seemed kind of obvious how things would end. However, not a bad read. It certainly kept me entertained. Nominally related to the Lester family stories, this particular book has Lord Philip Ruthven returning home, escaping from the hordes of matchmaking mamas. He' thirty-four and is starting to think about settling down, but wants to (like most Regency heroes) do so on his own terms. He arrives at home to find his stepmother's niece, his childhood playmate, Miss Antonia Mannering has arrived with her young brother. Apparently, after her father died, Antonia was kept holed up in the house with her brother since her mother just retreated from the world. At twenty-five, she could be considered "on the shelf" but her assuredness and grace make her just perfect for Philip. The back-cover-description of this book is a bit disingenuous. It makes it seem like Countess of Mareck, Josephine is actively trying to live down a scandal. But really, there's one old scandal no one knows about and the scandal of a swift marriage but it doesn't really seem like she's trying to live it down. She's established her life and nobody really brings it up except her sister. Anyway, she's been escorting her nieces through society and also corresponding with Sir Noah Rutledge for her ailing uncle-in-law. Who is Noah's actual uncle. Noah wants the man to move to Mediterranean while Josephine wants him to stay cloer to home. The story itself was amusing in some regards. However, the blatant and obvious disregard for abstinence before marriage made the novel less appealing. It was premarital fun all around in both stories. Sadly, I cannot draw any moral from either of them. I scratched my head as a pondered what it could be; what the author is trying to convey. All I've gathered is that the author, perhaps, wished to confuse the reader with how the novel is worded. At times, I had to reread sections to catch what was The story itself was amusing in some regards. However, the blatant and obvious disregard for abstinence before marriage made the novel less appealing. It was premarital fun all around in both stories. Sadly, I cannot draw any moral from either of them. I scratched my head as a pondered what it could be; what the author is trying to convey. All I've gathered is that the author, perhaps, wished to confuse the reader with how the novel is worded. At times, I had to reread sections to catch what was being said. I read Stephanie Laurens’ “A Comfortable Wife" several years ago, so this review is only for the novella "A Lady by Day." Josephine, a young widow, has happy memories of her brief time in the Mediterranean. She longs to live an unconventional life but is bound by society (as well as herself) to make amends for a youthful indiscretion. She is launching her two nieces into London society in the hopes that they will make better matches than she did. Until Sir Noah Rutledge comes along, upsetting her I read Stephanie Laurens’ “A Comfortable Wife" several years ago, so this review is only for the novella "A Lady by Day." Until Sir Noah Rutledge comes along, upsetting her very orderly and tightly-controlled existence, awakening passions and dreams she long thought lost forever. The first few chapters between Phillip and Antonia are sweet and romantic. Phillip's attention to her is adorable. Then the last 2/3 of the book we get an annoying side story, a misunderstanding that is WAY over done, like way over, almost insulting for Laurens to have something so trite, and Phillip ends up being a puss. A lot of the misunderstanding would have been resolved if he wasn't such a wimp and acted like a true Alpha hero and took charge. Stephanie Laurens is the first historical writer I read. then completely fell in love with . Each book I read I love. Some of the series are a bit on the same (exact) theme, but still the writing is jun, romantic and steamy when need be. Everything written by Stephanie Laurens is a must read. 2 stars for A Comfortable Wife by Stephanie Laurens which is really surprising because I usually enjoy her books. I just couldn't get into these two characters Philip and Antonia. I really enjoyed the second novel A Lady by Day by Alison Delaine. I love Noah and Josephine! I give this novel 4 stars! I won this in a goodreads giveaway. The first story, "A comfortable Wife" failed to impress me. It put me to sleep and I found none of the characters very likable. I would give that book a rating of 2 stars. The second story "A lady by Day" however, caught my attention. I loved the story line and the characters. I would give that one 4 stars, so I gave an overall rating of 3. The Trouble with Virtue are 2 novels in one book. The Stephanie Lauren's book, A Comfortable Wife, was just OK. It's a reprint. Not one of her best. A bit boring. The other novel by Alison DeLaine, a Lady By Day, was better. Together I only gave them a 3 star rating. Two Stories one by Stephanie Laurens and the other by Alison De Laine. Always love books by Stephanie Laurens. cant get enough of them. Alison De Laine never read her books before, but found hers was quite entertaining. A Lady by day was not very good.Hard to follow. Stars. Public Library 6/4/15. Started the first book but didn't strike my fancy... Maybe another time.